Discover the Simple Software that takes less then 5 minutes a day to help you see where all your money is going, control your spending, and actually start saving money. Are you frustrated trying to get by on the money you make? Would you like to get a good view to where all your money is going? Would you like to start saving your money, or save even more? Looking for something easier than software like Quicken or Money? Would you like to teach your children about finance? I didn't like my life. I wanted to be free of financial worries. I wanted to save more ,but I had no idea of how much I could save after paying all my bills. 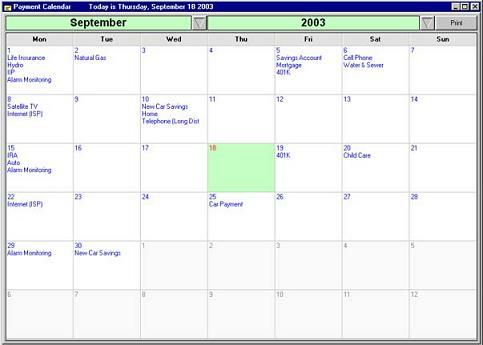 I tried products like MS Money, Quicken, and Excel but they did not work for me. They were too complicated or not flexible enough. It took me 1(!) hour just to setup my finances on MS Money. I needed a system that could teach me how to organize my budget, control my spending, save my money and does not require too much of my time. Since I am a programmer, I decided to create a software program to help me accomplish my goals. Even my 10 years old son has saved over $1000 and deposited it to his own savings account. If you'd like to finally get control of your money here is a solution - My Budget Planner. 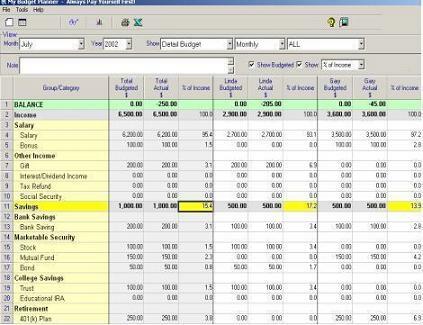 It is VERY SIMPLE and easy-to-understand personal budgeting software. You will spend less then 5 minutes a day using it. Show you where all your money is going. Provide you with an idea of your current and future financial situation both Monthly and Yearly. This software will help you keep track of everything from daily expenditures and savings accounts to insurance payments, auto maintenance, utilities usage, and even expenses on eating out and entertainment. It's so simple to record and view daily transactions. Help you to control your spending and pay off debt. and REMIND you when you overspend! No other product has a feature like that. Help you save 10% or more of your income. This software incorporates a rule: PAY YOURSELF FIRST. It will show you how to allocate your money into savings first and then into spending. The software will show you a PERCENTAGE of your savings FROM your INCOME (you will see if it's 10%, less or more). No other product has a feature like that. Help you create payments' schedule and remind you when payments are due! 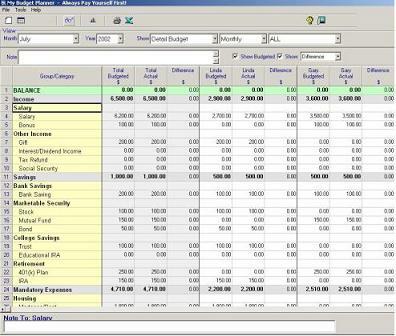 You'll get a visually display of all your savings and expenses. Easier than Quicken and MS Money. 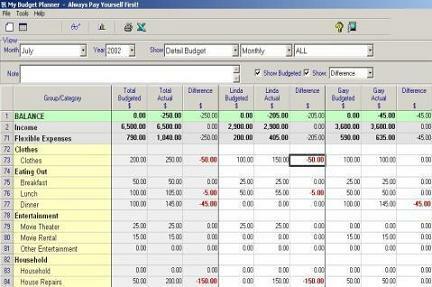 It takes hours to setup your budget using those software programs. They are too complicated. This software is so simple even children can use it. I've been using your software for almost a year now and love it. --Karin and Lorne Meredith from Victoria, B.C. I really like MyBudgetPlanner and unlike Quicken and MS Money, I can focus on my daily spending and being mindful about where the money is going. I really think this is a great tool for those who want to change their spending patterns so that their true goals are supported by their daily spending choices. I love the instant feedback so we can see where we are each day. We saved $1000.00 over two months by spending five minutes each day tracking where our money was going and making a few small adjustments. ...And last, I just wanted you to know that thanks to you, I have been able to keep a tighter reign on the finances, I have paid off bills, (and even a judgement, two to go), and have raised my credit score enough to be eligable for a house! THANK YOU!!! Compatible with Windows 7 and Vista! 30 Days Money Back GUARANTEE. There is no risk to you at all. If you are not satisfied, your money will be refunded and you will keep the software.